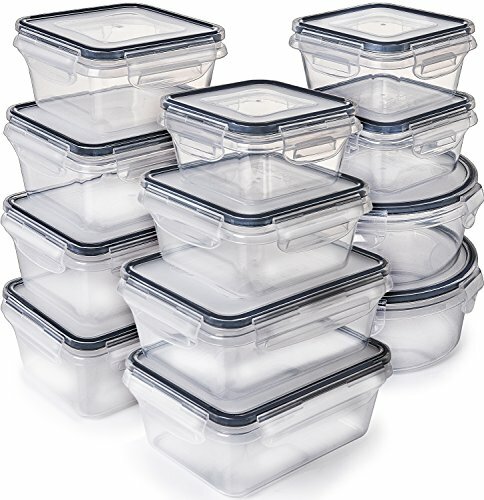 WHILE OTHER FOOD STORAGE CONTAINERS HAVE LEAKY LIDS & CHIP EASILY, Prep Naturals Glass Food Storage Containers are made of durable, high - quality glass & use Smarteslock locking lid technology, locking food in with an airtight seal for secure, leak-free storage. TAKE THE HASSLE OUT OF MEAL PREP AND PORTION CONTROL. Our 3-compartment portion control containers - the only ones on the market - are ideal for precise portioning, so you can put your meal plan into action. Comes with BONUS reusable cutlery that stows easily in a convenient lid compartment. NO MORE STRESSING ABOUT WHAT TO COOK FOR DINNER or WHAT TO EAT WHEN YOU'RE STARVING POST-WORKOUT. Just prepare food ahead of time or store leftovers in our containers, then pop them in the oven or microwave to enjoy a home-cooked meal anywhere - at home, work, school, or the gym. Fast & easy! PREP MEALS AT HOME, THEN EAT ON THE GO - great for an active lifestyle. Our glass meal prep containers are microwave, oven, and dishwasher-safe, allowing for quick preparation and easy washing. And because our containers are freezer-safe, you can store your food as long as you like. OUR CUSTOMER CARE PROMISE - We believe in making life easier & more enjoyable by keeping your food fresh & making mealtimes a breeze, whether it's a family dinner, snacks for the kids, or workout fuel. In the unlikely case that you don't love your container set, just return it for a full refund. Guaranteed not to leak, the Rubbermaid Brilliance Food Storage Container, Small, 1.3 Cup is intelligently crafted and beautifully designed. This BPA-free plastic container is built with an airtight leak-proof seal and secure latches. Crystal-clear lid and base makes it easy to see whats inside and is stain- and odor-resistant, which helps it stay looking like-new. Featuring a splatter-free lid design, built-in vents allow steam to escape so you can conveniently microwave food without removing the lid. 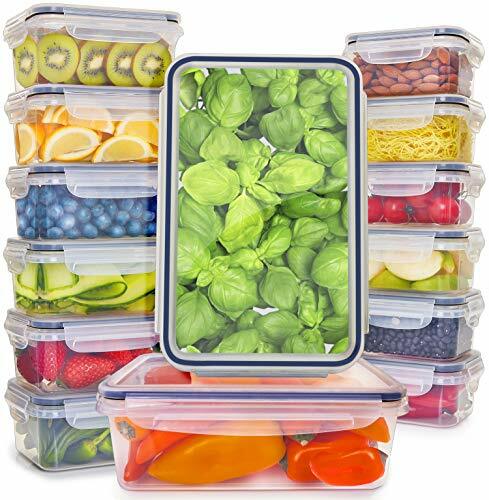 This food storage container also saves space, with a modular design that perfectly stacks in your fridge or lunch bag. Full lifetime warranty. 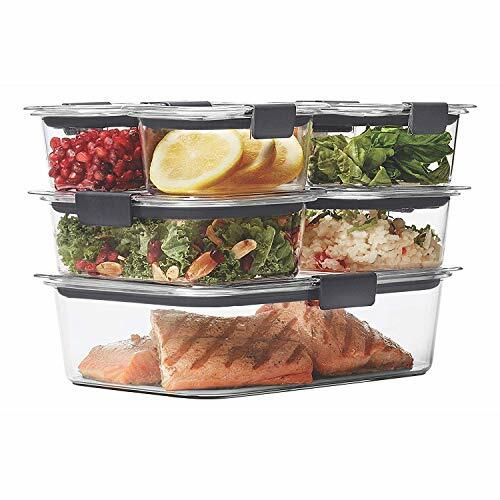 The Rubbermaid Commercial Space Saving Food Storage Container keeps food fresh, organized, and ready-to-use. Featuring easy-to-read graduated measurements in blue for liters and red for quarts, these plastic food storage containers make it easy to measure contents. Because we believe the best food storage containers use space efficiently, we've designed these plastic containers with a square shape that offers 25% more storage capacity than round containers. Constructed of break-resistant polycarbonate, they have a temperature range of -40 -212 F making them perfect for everything from freezer storage to sous vide cooking. Commercial dishwasher safe, they feature durable handles with drain holes for proper washing and drying. USDA-certified for food contact, it assists in complying with HACCP guidelines and is NSF 3-A Meat and Poultry Equipment and NSF 2-certified. QUALITY ENGINEERING - Its commercial grade, break-resistant, polycarbonate material allows for greater durability, product visibility, and a smooth surface, allowing for easy cleaning. DESIGNED FOR SAVING SPACE - Square containers store up to 25% more on a shelf than round containers, providing compact storage for your busy kitchen. MANY USE CONTAINER - While perfect for storing any food, these containers are also great for brining or marinating meats, as well as dry storage of cereals, rice, pasta, or trail mixes. 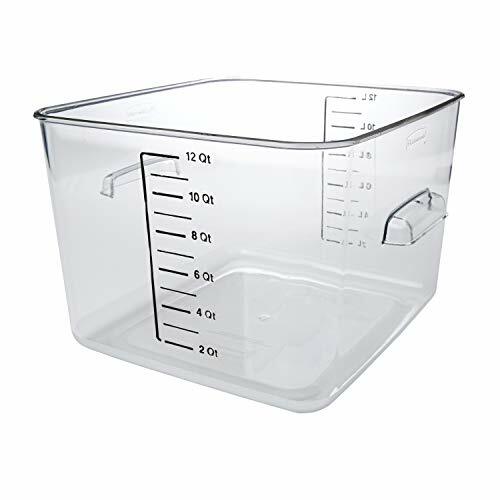 FOOD MEASURMENTS - This container features black quart and liter measurement gradations on both sides, allowing for easy portion control. 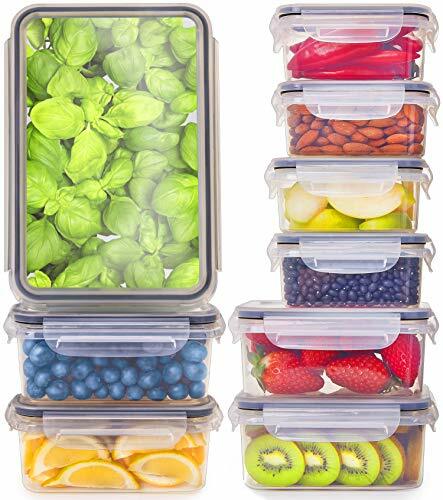 OXO Good Grips POP Containers are airtight, stackable and space-efficient, making it easy to keep your dry foods fresh and your kitchen organized. For a true airtight seal just push the button, it also pops up to serve handle for the lid. Designed for modular stacking, POP Containers' square and rectangular shapes make the most out of any storage space, no matter how tight. POP Containers are available in 11 different sizes: each one is perfectly calibrated to fit common household staples including 5 lb bags of flour and sugar, 1 lb bags of coffee, boxes of cereal, oatmeal, coffee, rice, pasta, spices and more. 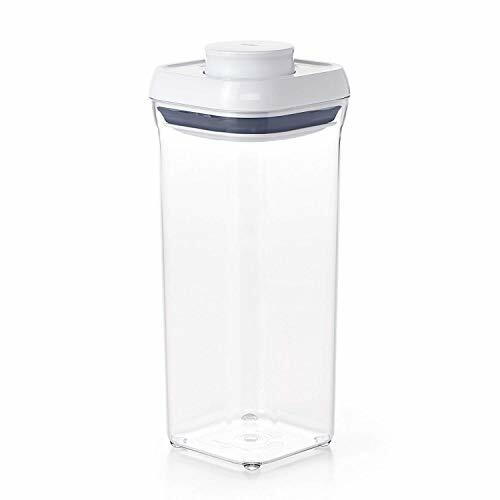 With curved corners for easy pouring, sturdy, BPA-free construction, and a that lid pops apart (and snaps back together) for thorough cleaning. POP containers aren't just for your kitchen: use them any place you want more organization! Think playrooms, bathrooms, garage, craft rooms - the possibilities are endless. The OXO Good Grips POP Containers are airtight, stackable and space-efficient, making it easy to keep your dry foods fresh and your kitchen organized. The Containers have a unique push-button mechanism that creates an airtight seal with just one touch. The button also serves as a handle to lift off the lid. The Containers are designed for modular stacking so that you can efficiently organize your countertop and pantry. In addition, with their square and rectangular shapes, the POP Containers make the most of any storage space, while their corners allow for easy pouring. The POP Containers are available in 11 different sizes to meet your dry food storage needs. They are also great for use in the garage, sewing room, play room and more; in fact, the Containers can be used in so many places that you'll want them POPping up everywhere. The lid comes apart for thorough cleaning. Customer Satisfaction is our top priority Fullstar insists on the highest quality materials and manufacturing processes to bring you superior kitchen accessories. We confidently offer a Money Back Guarantee on our Food Storage Containers.In the unlikely event that they do not perform as promised, return them for a 100% refund of your purchase price. 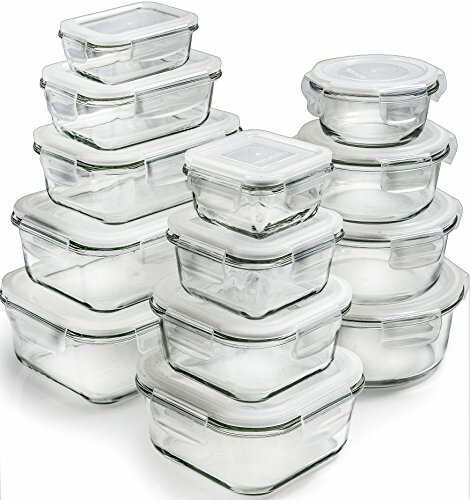 24 PIECE SET includes 12 containers with 12 lids. Store and transport entrees and soups confidently with our revolutionary snap-lock containers. Also great for small arts and crafts supplies like beads. FDA APPROVED polypropylene plastic contains no BPA, phthalates or other toxins to leach into food. Fullstar Containers are refrigerator, freezer, microwave safe (base only, NOT lid, under 5 min, under 700 Watt,*for at least half-full container). SPACE-SAVING utilization of freezer and cupboard area. Fullstar Food Storage Containers make efficient use of every inch of your home kitchen because they are stackable and nesting. Customer Satisfaction is our top priority. Fullstar insists on the highest quality materials and manufacturing processes to bring you superior kitchen accessories. We confidently offer a Money Back Guarantee on our Food Storage Containers. In the unlikely event that they do not perform as promised, return them for a 100% refund of your purchase price. 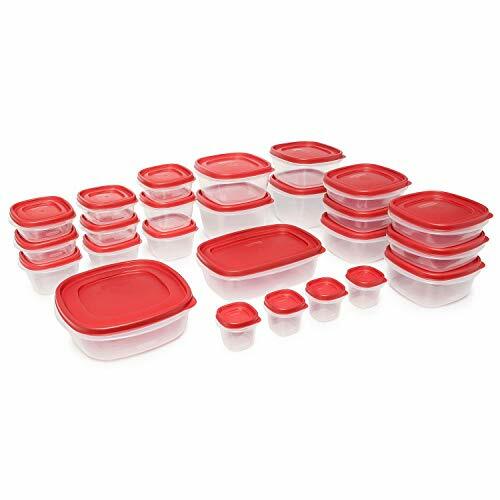 14 PIECE SET includes 14 containers with 14 lids. Store and transport entrees and soups confidently with our revolutionary snap-lock containers. Also great for small arts and crafts supplies like beads. 9 PIECE SET includes 9 containers with 9 lids. Store and transport entrees and soups confidently with our revolutionary snap-lock containers. Also great for small arts and crafts supplies like beads. FDA APPROVED polypropylene plastic contains no BPA, phthalates or other toxins to leach into food. 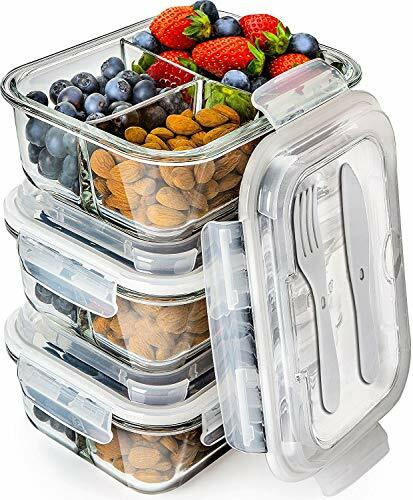 Fullstar Containers are refrigerator, freezer and microwave safe (base only, NOT lid, under 5 min, under 700 Watt,*for at least half-full container). SPACE-SAVING utilization of freezer and cupboard area. Fullstar Food Storage Containers make efficient use of every inch of your home kitchen because they are stackable and nesting.